An eco-design utopia with panoramic windows & handcrafted timber interiors. 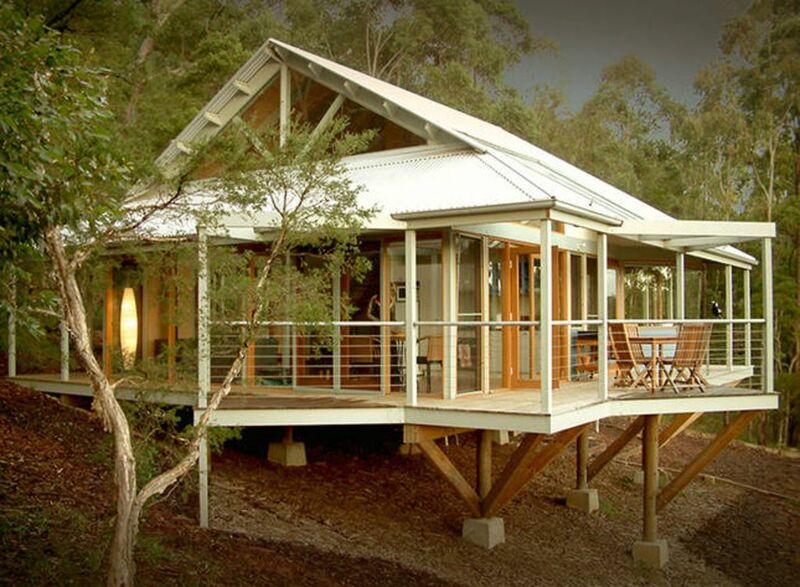 Our eco lodges are set in the treetops of our 100 acre wildlife refuge, surrounded by the Myall Lakes National Park. Pick from permaculture gardens, collect eggs from the chooks & check out the kangaroos under the solar panels. Stay in your own private treehouse in the heart of the Myall Lakes. Our small retreat of architecturally designed lodges are perfect for couples & small families. Each lodge sleeps between 2-6 people between a master bedroom and open treetop loft. Bombah is truly unique, built from the ground up on eco principles by a family passionate about nature, wildlife, sustainability and food. The sun-drenched living area provides spectacular 360 degree bush and valley views and each cottage is positioned discretely within the foliage to ensure privacy. With polished timber floors and modern interiors, cottage appointments are both stylish and comfortable with plenty of space to spread out and settle in. Floor to ceiling glass doors open to the surrounding veranda and provide the perfect place to put your feet up and watch the sunset or retire to the hammock to listen to the birds. The main living area also offers a large wood-burning fireplace as well as a new television, DVD and CD player. Cottages are ideal for 2 people with a large downstairs master bedroom. Extra guests can be accommodated in the upstairs loft. One cottage is larger and suited to 4-5 guests. Each room comes supplied with all the comforts you could want to fully relax in this setting – bathrobes, electric blankets and cozy doonas. Central to the spacious bathroom is a spa bath that we hope will encourage our guests to unwind and enjoy their time at Bombah Point Eco Cottages. We are a self catering retreat and have provided each cottage with all the tools and supplies necessary to create delicious meals. Bombah Point is surrounded by the Myall Lakes National Park, half way between the busy tourist hot-spots of Hawks Nest and Seal Rocks on the coast of New South Whales, 3 hours north of Sydney and 1 hour from Newcastle. Enjoy sunset from the verandah after grabbing some herbs from the vege gardens to complete your gourmet meal. Then dip into your rainwater spa with a glass of bubbly or curl up in-front of the log fire. The property and surrounding national park is renowned for bird watching, swimming, bushwalking, surfing, swimming, beaches, fishing, trekking, kayaking whale watching, diving and mountain biking. There are a range of excellent day trips to enjoy during your stay, from the country town of Bulahdelah 10minutes to the west, to the whale watching from the lighthouse at Seal Rocks and surfing at Blueys Beach or the majestic sand dunes near Mungo Brush and beaches around Hawks Nest. Less than 3 hours drive from Sydney, the Myall Lakes region feels like a magical escape from the hustle and bustle of the city. Thousands of hectares of unspoilt National Park provide the perfect environment for some of Australia’s most diverse and abundant wildlife to flourish - visitors to the area are likely to see everything from sea eagles, pelicans and egrets to wallabies, kangaroos, bandicoots, goannas and even the occasional koala. The area also hosts one of Australia’s largest and most interesting coastal lake systems as well as protected waterways, wetlands and more than 40 kilometres of spectacular unbroken beaches. Of the region’s lakes, Myall Lake, Wallis Lake, and Smiths Lake are the largest and cover more than 10,000 hectares and were created between 6,000 and 10,000 years ago when sea levels rose and flooded much of the low lying coastal land. Myall Lakes National Park, which borders the Bombah Point Eco Cottages property on three sides, includes the largest and oldest sand dune system in New South Wales. The hind dunes were formed before the last Ice Age and now huge trees grow in their mineral-rich sand. There are numerous Aboriginal sites hidden in the dunes and visitors can find themselves wandering through areas of stone tools, axe heads, bones and shell deposits that were hidden for thousands of years and only recently revealed by shifting sands. These sites are heralded as some of the most significant and extensive sites in coastal NSW and are protected. A short drive north is Seal Rocks where dolphins can be found frolicking in the surf and visitors marvel at the spectacularly beautiful lighthouse built in 1875 and officially known as Sugarloaf Point Lighthouse which overlooks an unspoilt beach and the group of offshore rocky outcrops which give the area its name. Whales pass close by here between May and August each year. Port Stephens, the picturesque bay that provides water views for Nelson Bay, Tea Gardens and Hawks Nest is also quite well known for its marine visitors, dolphins and particularly the whales with off shore whale watching tours available in season. It also has the largest permanent population of dolphins on the east coast, more than 200, offering visitors a 99% chance of seeing them on a ferry trip to Nelson Bay. The region also includes Booti Booti National Park, Wallingat National Park, and Tomaree National Park as well as several additional designated nature reserves. The Myall Lakes region is as diverse as it is engaging and everyone, from the most adventurous to the more serene, will find the perfect activity to suit their mood. We often find our guests have been reading by the fire or napping in their cottage hammock, but opportunities abound for those visitors who wish to explore the area further. Drive then walk to the lighthouse at Seal Rocks or wander through giant sand dunes littered with ancient Aboriginal tools. Call into to Hunter Valley on your way and purchase a bottle or two of the best ones to sip on your cottage veranda. Indulge in fresh oysters and local prawns at Tea Gardens or lie in the sun at one of the many nearby beaches. Pick up some iconic Australian food from the local rural town of Bulahdelah - great pies at the local pub, Bulahdelah "high top" at the bakery, home smoked bacon at the butcher – or stroll with a picnic basket full of fresh local produce to a secluded beach at the lake’s edge. A day trip takes you to Barrington and Gloucester Tops which are famous for their giant trees, alpine environments, and spectacular waterfalls. Perfect for exploring the old logging towns or taking a guided or self guided walk through old growth forests that survived the era of clear felling. Eucalyptus grandis and Antarctic Beech grow to over 70 meters. There are a wide variety of walking trails that wind their way through the property and into the National Park. Short, easy walks are available for families, with more challenging climbs for the keen bushwalker. A complete list of local bushwalking trails with detailed maps are available onsite. Casual observers and bird enthusiasts alike are sure to be rewarded when they visit Bombah Point. Due to its proximity to a wide range of environments, the area boasts an incredible variety of birds including minute wrens and finches, parrots, ospreys, black swans and Jabirru right up to the huge and majestic Wedge Tail Eagle and White Bellied Sea Eagle. 280 varieties of birds have been recorded in Myall Lakes National Park and of the over 100 recorded on site, many can be seen right from your cottage veranda! The pristine waterways and resident wildlife of the Myall Lakes provide an ideal environment for memorable paddling, particularly since much of the area is best viewed from the water. Find a hidden cove or picnic on an island on one of the 4 lakes while you listen to the native wildlife. Use our kayaks, bring your own boat or kayak or hire in Tea Gardens where guided kayak tours are also available. For those guests wishing to explore on two wheels and get away from tourist spots, the area offers both scenic National Park tracks and roads with little traffic. Information about local rides is available on site. Bring your own or bike hire is available in Tea Gardens. Between June and October an estimated 3,000 whales pass by Port Stephens making the area one of the most popular to view these majestic mammals. Several whale watching cruises operate in season from Nelson Bay. Dolphins are also abundant in this region and can be seen year round from many of the local beaches or aboard one of the local ferries that depart daily from Tea Gardens. Thanks to the surrounding Melaleuca or “tea trees”, swimming in the local lakes is said to leave the skin soft and cleansed and there are plenty of easy access points nearby. For those preferring a dip in the surf, the 40 km of unbroken sandy beach provides endless opportunities to cool off in the ocean. Surfers will find excellent breaks at the Hawks Nest patrolled beach and scuba and snorkelling enthusiasts will find memorable dive sites around Seal Rocks, Broughton Island, Dark Point and The Boulders. Bombah Point Eco Cottages are 7 km from the ocean at Mungo Brush. Bombah Point Eco Cottages are 2 km from Korsmans Landing on the Myall Lakes. Great cabins and facilities in a beautiful environment. And great, friendly hospitality. Hi Ciara, Thanks for coming to Bombah and we hope to see you again soon. Cheers Duncan, Suzie & Gail. We loved our stay here. Great kitchen, bathroom and comfy beds! Plus the cottage's design lets you see and appreciate your bush land surrounds. What a beautiful way to end the year. The eco lodges are nestled in the bush away from civilisation. Situated in a beautiful part of the world, we were able to visit Seal Rocks, The Grandis and Boomerang beach, as well as chill out by the pool. Highly recommend this place, would love to go back again when it's a little cooler and take advantage of the walking tracks around the property. Magical weekend at Bombah Point Eco cottages. I travelled with my partner for a long weekend for our anniversary and it couldn't have been better. The cottages themselves are absolutely beautiful; situated deep in the bush, surrounded by the nature and wildlife, (We saw kangaroos, goannas, kookaburras and more!) They are clean, well equipped and big. We particularly enjoyed the spa bath overlooking the bush. ?Jamie, Jackie and Gail were perfect hosts. They gave us lots of information about the local area and encouraged us to take a trip to Dark Point sand dunes (A great recommendation.) They encouraged us to visit their orchard and vegetable gardens, where we picked lots of fruit, vegetables and herbs. Delicious (...and makes a change from Coles!) Perfect weekend, perfect cottage, perfect hosts. Highly recommended. It is a very restful place, great games room and pool, the walks on the property are great. Loved feeding the chooks!! The cottages are delightful and so well kept. So far away from every thing yet not that far to coffee & cake and the best fish & chips.